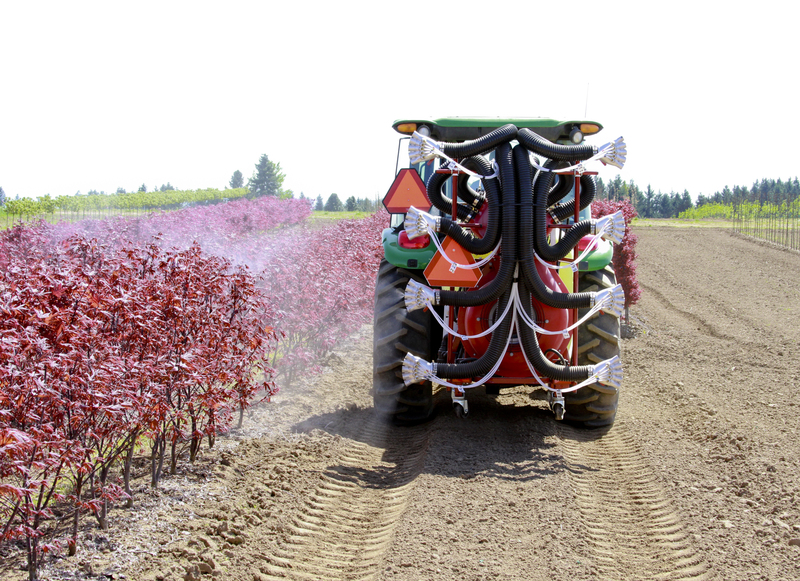 Hans Nelson & Son Nursery in Boring, Oregon was one of the locations where researchers and growers tested the smart sprayer over the past several years. After years of research, nurseries looking for a machine to selectively apply fertilizers and chemicals to their plants — and only their plants — finally have what they wanted. The USDA Agricultural Research Service has licensed its smart sprayer technology to Smart Guided Systems LLC, the agency and the company announced. Orders are being accepted for delivery in spring 2019. An add-on kit option enables growers to retrofit existing spray equipment. Orders for the equipment were being taken at the recent Farwest Show, which was held August 22–24 in Portland, Oregon. Dr. Heping Zhu, an agricultural engineer stationed at the USDA ARS station Wooster, Ohio, designed the Intelligent Spray Control System to help bring precision agriculture to environmental horticulture. A laser on the sprayer detects the plant canopy; that information triggers spray nozzles to activate only where plant material is present. The result is that much less spray is required. 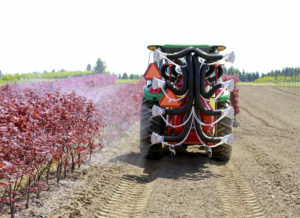 Dr. Zhu and the other researchers determined that the machine could reduce pesticide needs anywhere from 47–70 percent while still maintaining the same efficacy. They determined this would save nursery producers $140–280 annually in pesticide cost per acre. The technology also helps beneficial insects that may be present in the environment or may be applied by the grower. They are helped by a reduction in airborne drift of up to 87 percent and a reduction in drift on the ground of up to 93 percent. The technology was tested outdoors, but Dr. Zhu is currently working to adapt it to greenhouse operations as well. The Horticultural Research Institute (HRI) provided seed funding to get the project started. This was then used to garner additional funds through the USDA ARS Floriculture and Nursery Research Initiative and USDA NIFA’s Specialty Crop Research Initiative programs, both supported by HRI. Oregon State University and The Ohio State University took part in the research. The Oregon Association of Nurseries pushed for federal funding, and members of Oregon’s Congressional delegation were supportive.